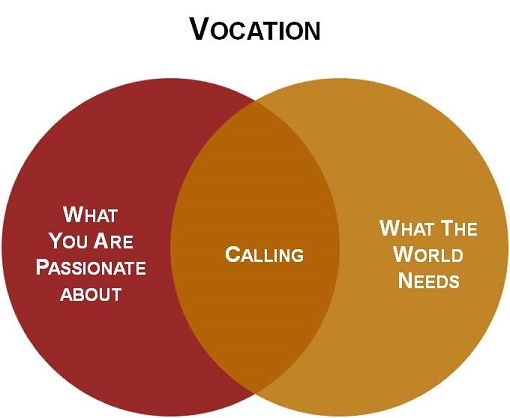 While traditionally the word vocation has been used to describe a person, typically male, being called by God to a particular role, it's now used in a secular context, along with words like work, profession, or occupation. This article explores the question What does vocation look like for today's woman?" Based on the premise that each person brings unique gifts oriented toward a specific purpose, a reflection on one's vocation or calling can be considered by asking "How am I currently expressing meaning and purpose in my life?" "What changes, if any, might I wish to make?" The inherent need to work is part of who we are as human beings. Work is psychologically necessary for healthy development. It influences a person's broader life experience, providing a way to enjoy a sense of belonging and contributing to a general belief that what we do is important. Work is also a social experience. In addition to providing an opportunity to experience satisfaction from task completion and, perhaps, significant accomplishments, work also affords opportunities for affiliation and meaningful relationships. In Parker Palmer's book, Let Your Life Speak: Listening for the Voice of Vocation, he challenges the individual to listen to her life, to try to understand what it is truly about, because vocation is not an external goal to be pursued, but rather, an internal calling to do something with one's life based on the individual's true identity and the values held in her heart. This fits a feminine vocation model with space to change and choose based on one's authentic self. It also supports the reality of women's careers as non-linear, with transition or change often prompted by values and stage of life. The satisfaction that comes from experiencing a meaningful career in both paid and unpaid roles increases significantly when we are able to live out our life's purpose through our work. A life lived on purpose is healthy from all perspectives: psychologically, spiritually, socially, and physically. When we are purposefully engaged in a freely chosen vocation, we are authentically present and feel fully alive. What is it that you wish to accomplish in your lifetime and why do you feel compelled to do it? What is the difference between being driven to accomplish and being called to complete? What do you think lies ahead in the next stage of your life?